Taking the broadest possible view, the Empires of Faith project examines imagery from those religions that have survived (Judaism, Buddhism, Christianity and Islam as well as the polytheisms of India) but also many lost religions from the cults of the Roman Empire to Manichaeism. To do so, it looks across the north Atlantic and Mediterranean worlds, the Indian Ocean and beyond, from Britain and Spain in the west to the Indian subcontinent and the borders of China in the east. The project aims to put the best of new and current research on late antique religious history and archaeology at the University of Oxford side by side with the unparalleled scholarly and material resources of the British Museum, in an experiment in intellectual collaboration between the two institutions in the United Kingdom with the greatest strengths in the material culture of this period. Varaha, the boar avatar of Vishnu, 9th-10th century, Ashmolean Museum EA 1969.43. The intention is both to forge a method for doing a global comparative art history of religions, within the specific temporal and geographical limitations of the project, and to produce a series of fundamental studies on key themes of religious change, self-assertion and identity through visual means. No research project has ever before attempted to take such a broad view of this subject, region, and period. Only by looking at this area as an interconnected whole, and by bringing together perspectives from a wide range of academic specialisms and disciplines will these vital features of this pivotal period – and their continuing legacy – be able to be properly understood. Objects provide a rich source of evidence to explore these complex developments that still have lasting consequences for the modern world. Not only do the iconographies and forms of worship of all these major world faiths originate between AD 200 and 800, but the particular relationships between state and religion established then persist as an issue to this day, shaping key debates about the possibility and desirability of containing multiple, conflicting religious and social identities within a single state. The project develops innovative ways of integrating objects into the discussion of these key questions: earlier studies have been mostly conducted with reference to textual evidence. In societies where few could read, political authority and religious truth were constructed and communicated through images and objects to both elites and wider constituencies. In this period, artefacts and images – and the architecture in which images occurred and some objects were used –embodied and disseminated complex theological and political ideas. This can be seen in religious and political imagery made at this time, whether monumental such as the Bamiyan Buddhas or the mosaics of the Roman emperor Justinian at Ravenna, or in miniature: for instance, the images of Hindu divinities on the seals of Gupta kings or the first Islamic gold dinars which displaced the image of the caliph himself with a verse from the Qur’an proclaiming the oneness of God. Part of the Mshatta facade, 8th century, Jordan, now in the Pergamon Museum, Berlin. A book aimed at a non-specialist readership on the themes of this research and their continued legacy is in production. Empires of Faith: Histories of Image and Religion in Late Antiquity, from India to Ireland. An historiographic research volume written by members of the project addressing key problems for the study of religion through material culture is under review. Images of Mithra, the first in a new book series entitled Visual Conversations by Oxford University Press was published in March 2017 aimed at a public and academic audience. Imagining the Divine: Art and the Rise of World Religions, a major exhibition, curated by the project for the Ashmolean Museum (19th October 2017 – 18th February 2018), accompanied by an exhibition catalogue. 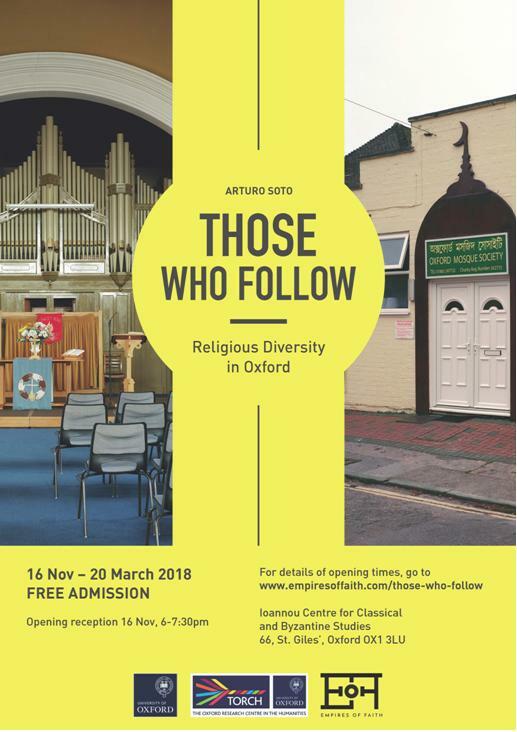 Those Who Follow, a student-run photography exhibition focussing on modern religious spaces in Oxford and their communities (October 2017 – April 2018). Interrogating the Antique Visual Tradition and Its Legacy, Globalized Classics, Humboldt University. Empires of Faith, led by Jaś Elsner and Finbarr Barry Flood, ran an eight day panel on the study of material culture and religion as part of this international Summer School in 2015. Empires of Faith: Comparativism, Art, and Religion in Late Antiquity, Chicago University. The project presented their work at this conference to a broad range of academic experts at this critical halfway point in the research process. Imagining the Divine: art in religions of Late Antiquity across Eurasia, Oxford University. An international conference to be held 11th-13th January 2018. Talking Religion, an AHRC funded programme organised and run by members of the project for current doctoral students at Oxford on the study of material culture and religion.